Sunday October 11th 1891 I was busy about the work all the forenoon. Agnes did not get home till ten oclock. The folks were all over in the afternoon. Will went over to Woolfs awhile. Agnes came back to help get supper. Will and I went over to Chalfonts for a call and then on to Church. I got no writing done today. Monday October 12th 1891 We washed this morning and the clothes got dry by noon and we had them all ironed by four oclock. I then moved the sewing maching into the kitchen and pieced the old pillows into cotton beds. Will and I went to town in the evening. Tuesday October 13th 1891 I hurried through with the work this morning and made a cotton bed for Ida before noon and in the afternoon made one for ourselves. I wrote to Vene in the evening and done some other work. I got my new [totle?] and sent away the old one. Wednesday October 14th 1891 I fixed one rocking chair cushion in the forenoon and soon after dinner Will and I went to town to get Father a suit of clothes. I done some trading for myself. I went down to Hatts and found the girls with Miss Fanny Hepburn was over home. After they went away Will and I went out to Marys. I wrote a letter to May in the evening and done some other work. 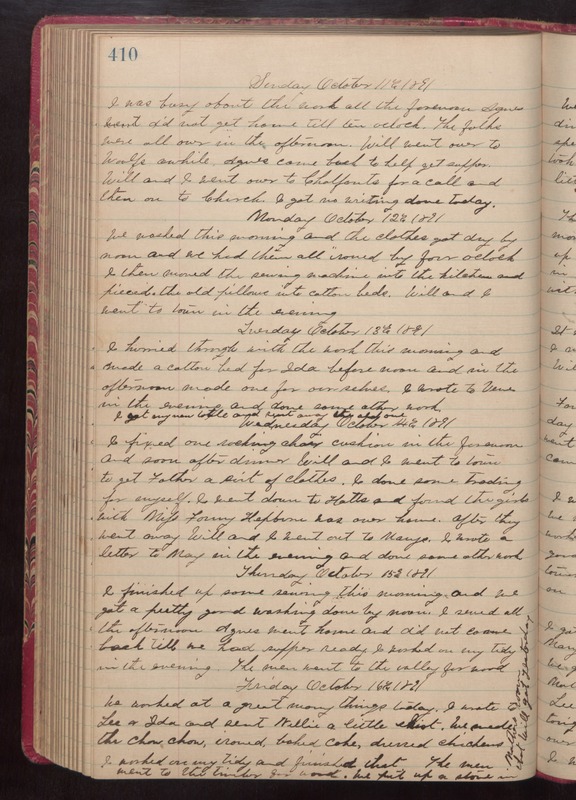 Thursday October 15th 1891 I finished up some sewing this morning and we got a pretty good washing done by noon. I sewed all the afternoon. Agnes went home and did not come back till we had supper ready. I worked on my tidy in the evening. The men went to the valley for wood. Friday October 16th 1891 We worked at a great many things today. I wrote to Lee & Ida and sent Willie a little shirt. We made the chow chow, ironed, baked cake, dressed chickens. I worked on my tidy and finished that. The men went to the timber for wood. We put up a stove in Mothers room that Will got yesterday.